A contract for assembling pioneering suction bucket foundations for Vattenfall’s European Offshore Wind Deployment Centre (EOWDC) has been awarded. 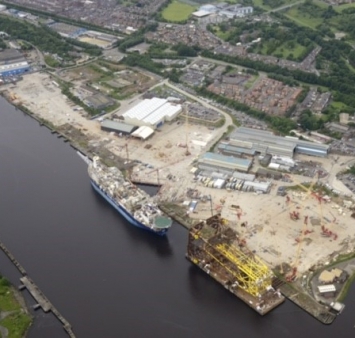 Smulders Projects in Newcastle is to carry out the work on the 11 foundations for the ground-breaking 92.4MW EOWDC, off Aberdeen Bay. It is believed to be one of the first UK offshore wind projects where suction buckets will be deployed on a large scale. Through being paired with 11 of the world’s most powerful turbines, the suction buckets will also create an industry first. Smulders’ 300,000m² manufacturing hub in Newcastle, which continues to support OGN’s operations, has facilities for constructing jackets and substations. Since taking it over, the company has also invested in additional lifting capacity including two gantry cranes which can each lift up to 600 tonnes. In addition, work is underway to install a large ring crane with a lifting capacity of 3,200 tonnes. David Muylaert, deputy managing director, at Smulders, said: “We are convinced that with expanding our production platform with this new facility in Newcastle upon Tyne, we not only added local content in the UK and an additional production capacity within the Smulders group, but also have created an excellent base close to the renewable and offshore market within the UK.